The quickest and easiest biscuits in the universe, these Parmesan Dill Biscuits are only a few ingredients, and are moist, fluffy, and have perfect flakiness. 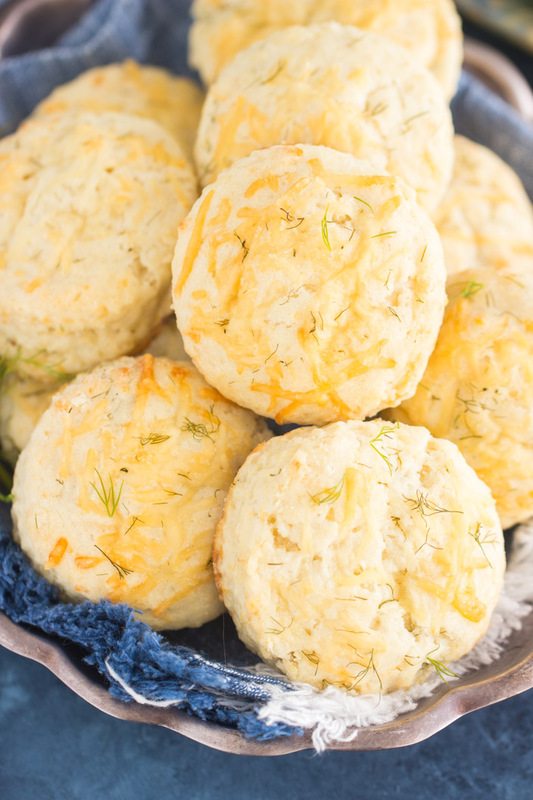 Parmesan and dill add extraordinary flavor, and these Parmesan Dill Biscuits couldn’t be simpler! 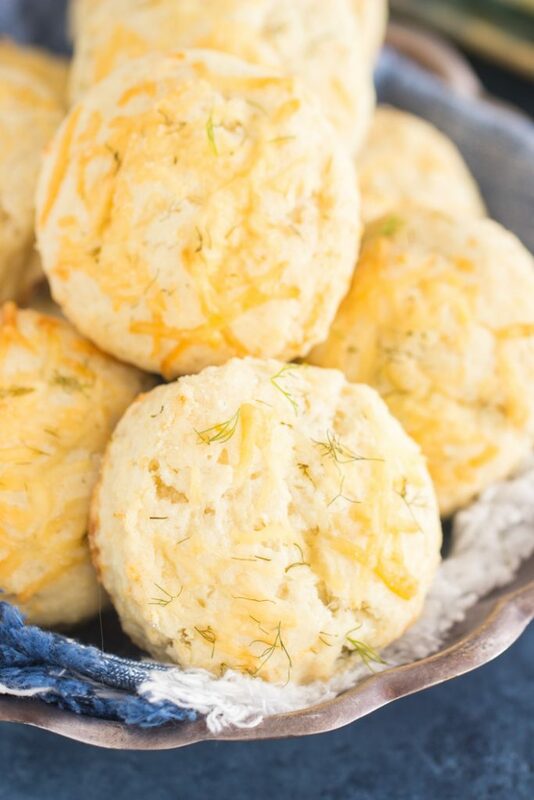 You NEED these Parmesan Dill Biscuits at Thanksgiving and/or Christmas dinner and/or whatever holiday celebration meal you’ll be partaking in, but more importantly perhaps, you need these for leftovers. 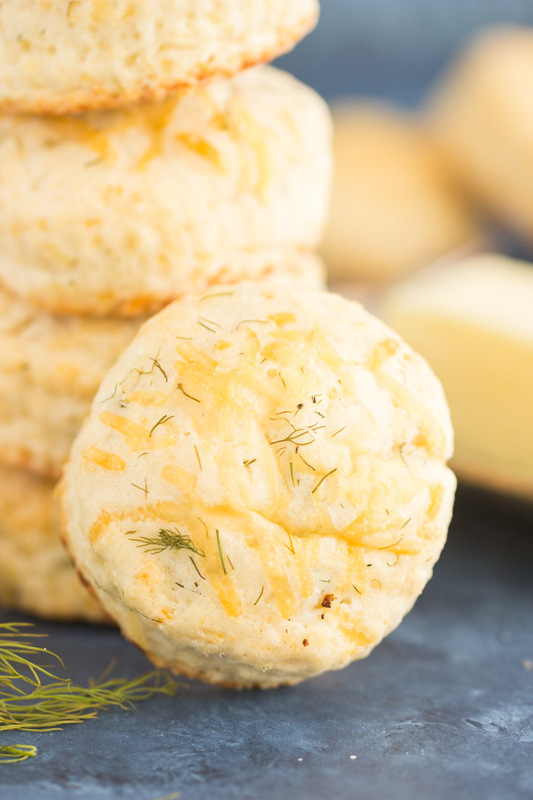 I was *obsessed* (and you know I don’t throw that word around) with cutting these Parmesan Dill Biscuits in half, slathering a little olive oil mayo on each half, and sandwiching them with slices of leftover rotisserie chicken. I ate that meal 5x in a row. Two dinners on a Monday evening, then for breakfast and lunch on Tuesday, and then a post-gym snack in the afternoon. And I could’ve kept going, but I ran out. But now I cannot wait to do this with turkey leftovers!!! My Gma always used to grind up leftover turkey from Thanksgiving to make turkey salad. Which is an even greater idea, and that is what I intend to do after Thanksgiving. 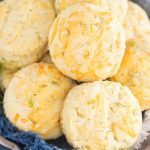 It will be the most perfect little turkey salad slider in the world on these Parmesan Dill Biscuits. 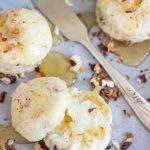 I made similar biscuits last year, these Super Quick & Easy Toasted Pecan Goat Cheese Biscuits. Those are the same base recipe, but I swapped out pecans and goat cheese for different add-ins: Parmesan and dill. Easy peasy. 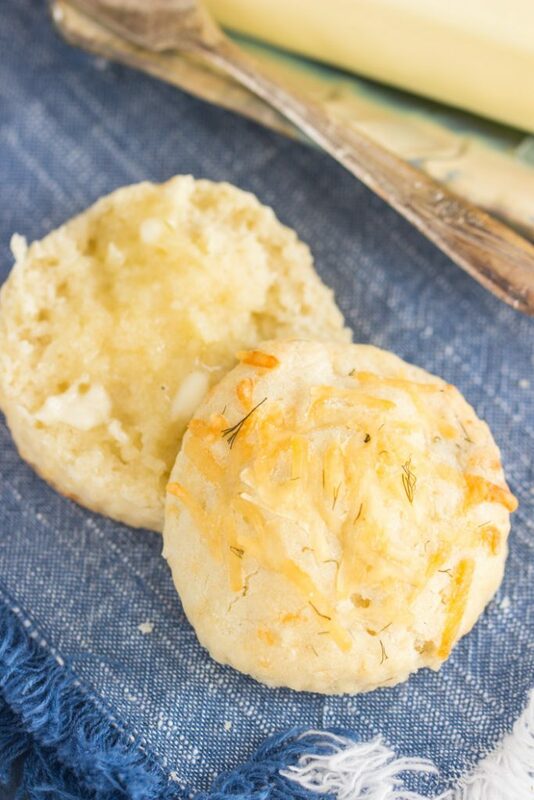 The Parmesan cheese and dill add extraordinary flavor, and complement each other perfectly. Who doesn’t love all things dill and Parmesan, ya know? 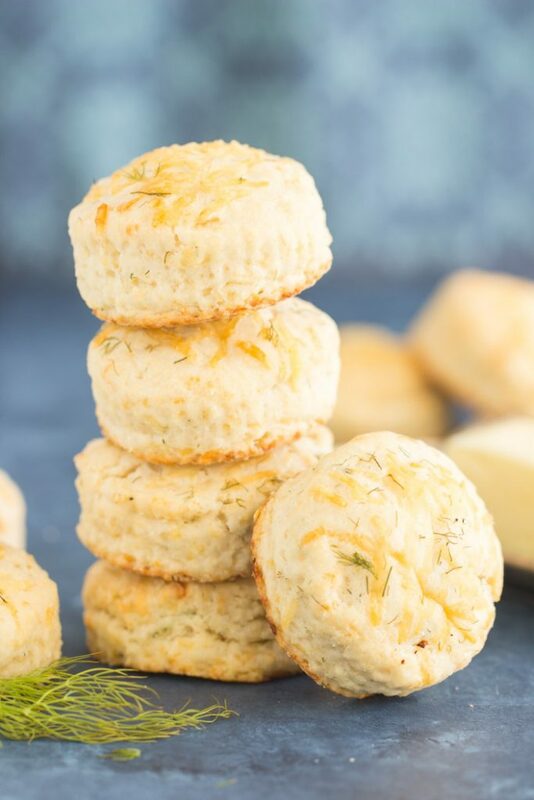 The basic recipe is “cream biscuits”, and they couldn’t be easier, and despite the super simple list of ingredients and lack of butter, they are anything but tasteless and tough. They’re fluffy and moist, with perfect flakiness. Just mix the ingredients altogether, cut into biscuits, bake. You can be eating these hot from the oven in 25 minutes, start-to-finish. Such a short window of effort. These use heavy cream instead of butter for the fat component and as a binding agent. The heavy cream gives all the richness and necessary fat content of butter, but is much quicker and easier to incorporate into the dough. Butter is typically worth the extra effort to cut in or grate into a biscuit dough, but it’s just not necessary in these cream biscuits. 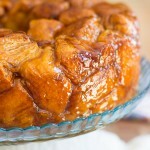 These are fabulously rich and flaky! 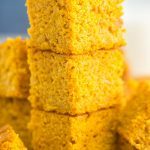 I adore the easy and simplicity of this recipe. 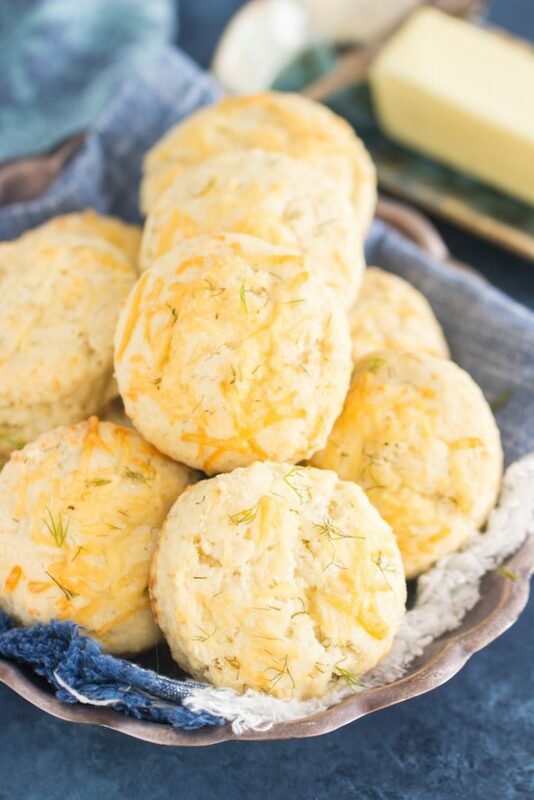 The quickest and easiest biscuits in the universe, these Parmesan Dill Biscuits are only a few ingredients, and are moist, fluffy, and have perfect flakiness. 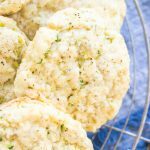 Parmesan and dill add extraordinary flavor, and these Parmesan Dill Biscuits couldn't be simpler! Add heavy cream, 1 cup Parmesan, and 1/4 cup dill. Stir with a wooden spoon just until the dough forms, which will happen quick - just a few stirs. The cream absorbs very fast. Form dough into a 3/4-inch thick disk on a lightly floured surface. 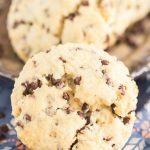 Cut dough into rounds with a 3-inch biscuit cutter or round cookie cutter. Reform scraps to continue cutting biscuits. Place rounds on a parchment paper-lined baking sheet, at least 1 inch apart. Brush the tops lightly with remaining heavy cream. Sprinkle with remaining Parmesan cheese and dill. Bake at 450 degrees for 15-18 minutes, or until the bottoms are golden brown.